There is an empty chair at the back of the classroom. It is filled by Ahmet, the boy with the torn backpack who can’t speak English. He has come to London in a boat with his family - another Refugee, running from war, searching for a safe place to live. On the way, the sea claimed his young sister and his dog. Now his parents are missing so he lives with a foster family until they are reunited. On the first day at school, the other nine year olds keep looking at him. One particular girl gives him a smile and a lemon sherbet. She is part of a group of best friends that decide to take him under their wing and help him adjust to his new life. But Ahmet is the food that bullies feed on, and things will not be easy regardless of the good intentions of the group. How can children discover the whereabouts of missing persons? Perhaps the Queen can do something! She is in charge of everything and is a powerful figure that can get things done. How hard can it be? The group set out with a plan, carrying tea bags and biscuits anticipating afternoon tea and conversation with the Queen. With the gates closing to refugees in a matter of days, the children’s goal of finding Ahmet’s parents becomes paramount. They are definitely not prepared for what follows. The friends find themselves tangled in a great and life-changing adventure. They are arrested for interrupting the Changing of the Guards at Buckingham Palace, become front page news with cameras and journalists begging for interviews, and show the world the meaning of compassion, friendship, acceptance and the joy gained in embracing something new. The empty chair has come to symbolise the space made available for Refugees. 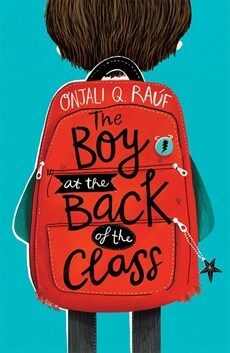 Short-listed for the Blue Peter Award 2019, Boy at the back of the Class is narrated from a child’s perspective. Full of innocence and hope, humour and determination, this book reflects how children view and feel about the Refugee situation. The book intends to bring attention to the plight of refugees, especially children separated from their parents, and the psychological damage that this separation causes them. This is a project included in the many undertaken by Onjali Q. Rauf, founder of Making Herstory, whose many roles in life are worth looking into. This is her first book.